I am on the run this week. A 30"x36" painting is on the easel almost finished. A trip to Ft. Pierce is scheduled for Thursday to pick up paintings from the Backus Gallery Women's Invitational Show that closes Friday. Then back to Mt. Dora to help my husband, Harry, finish setting up for the Festival that opens Saturday, February 6 and runs through Sunday February 7. If you are in the area this weekend the Mt. Dora Festival is a must see. Over 285 artists will be displaying their wares on the streets of this usually sleepy little village-like town. This is my first show in 2010 and I am excited about my collection of new paintings. Artists don't get booth assignments until we check in Friday so pick up an Artists Information Booklet to find me. Mention reading about the show here, on Face Book, or getting an email announcement and receive 10% off your total purchase of my artwork at the Festival. Congratulations to Ana for offering the winning bid on the last two miniature auction paintings, Great Blue Heron and Pink Hibiscus. I have been asked to slightly change the weekly bidding time line. Some folks bid during the work week and miss the Sunday, 5pm deadline. So, the bidding deadline will now be on Mondays at 5 pm EST and I will announce the winner and post the new painting on Tuesdays. This change should allow more people to bid right up to the deadline. The Golden Tabebuia Tree is this weeks miniature painting up for auction. It is 5"x 7" painted in oil on canvas board. This tree is also call a Trumpet Tree. 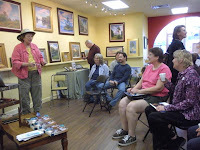 Lucy Beebe Tobias and her book "50 Great Walks in Florida" was a big hit at our first monthly Coffee and Conversation at Voilart! Art Gallery + Studio. Photos were shown as Lucy talked about each of the walks discussed in her book. People kicked back, sipped coffee and chatted with Lucy. Our goal of having a relaxed, salon-type event was successful! To peak your interest in our next guest I will just tell you she is one of the most accomplished plein air painters in Florida, if not the nation. Mark your calendars for Saturday, Februray 20, 4 PM. You don't have to be a painter to thoroughly enjoy this upcoming presentation! Coffee & Conversation at Voilart! Art Gallery + Studio is a new monthly event featuring artists, writers, poets, musicians and other fascinating talent of interest. Authentic Florida author Lucy Beebe Tobias is our guest speaker for the January inaugural "C & C" January 23, 4 pm, 108 E. Ft. King Street, Ocala. Lucy will share excerpts from her book "50 Great Walks in Florida", while a continuous slide show illustrates the natural beauty and history to be savored on her Florida adventures. Vivid descriptions of sites to explore as well as dinning and shopping suggestions are included. All attending will receive her free booklet "Let's Go Walking in Florida" which includes maps, trip essentials and a history of the locale. Pink Hibiscus 5" x 7"
The hibiscus flower comes in such a wide range of colors, but my favorite is pink, yellow and red. I have painted many of these over the years and still find them interesting. They are found all over the state of Florida and should be the official State Flower. This painting is on canvas mounted on board ready to frame. By the way, the winning bidder may have the option of purchasing a frame along with their painting, at an additional cost. "Through Women's Eyes by Women's Hands"
It is truly an honor to have been invited to participate in the exhibition now being held at the A.E. Backus Museum in Ft. Pierce, Florida. "The show promises an outstanding line up of talented women artists featuring a wide array of media", Kathleen Fredrick, Director. If you have not been to the Backus Museum treat yourself to the experience. 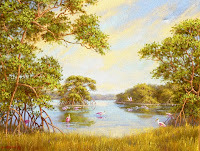 See the best Florida landscape paintings found anywhere as you peruse the Museum's extensive permanent collection of work by Florida Artist Hall of Fame Recipient A. E. "Bean" Backus. You can even purchase one from their gallery of consigned paintings. Be sure to also see paintings by the Indian River School of Painters, of which I am proud to be included. We have had a 5" x 7", 4" x 6" and now a tiny 2" x 3" painting in the auction. This Great Blue Heron was strutting around when I was painting at Silver Glen Springs last summer. He just begged to be painted. They are such elegant birds with their long legs and beautiful color. They stand motionless for long periods of time so I can't resist painting them. Then suddenly they will lunge out to spear a fish swimming by. Their quickness is quite impressive. From the number of bids being offered on paintings these last few weeks it seems like you all are having as much fun as I am with the auction. Remember, the bidding deadline is 5 pm EST on Sunday night. I had a bidder just miss the deadline last week and was disappointed. My good friend and Painter Extraordinaire Linda Blondheim won this weeks Auction Painting. I am so please to have my little painting go home with Linda! Here is this weeks painting. "River Sunset" is 4"x6" painted in oil on Gallery Wrapped Canvas. Remember the bidding starts at just 99 Cents! Email your bids to me with "Auction" in the subject line. All bids must be in by 5pm EST Sunday night. Tomorrow night, Sunday 5 pm, ends this first weekly auction. The current high bid is from Linda at $25.00. If you want to join in the bidding just email me.